Dear Neighbor,On behalf of the James City-Bruton Volunteer Fire Department, we would like to cordially invite you to the Dedication and Open House of James City County Fire Station One on Saturday, March 18th at 12pm. In 2012, we started this journey together. Five years later, after a lot of hard work, we have arrived at the time to dedicate this building and commission it for the job it was …intended; to serve the citizens of James City County. The festivities will begin with a ceremony at noon to dedicate the building and will include our honor guard, special guests, bagpipes and the ceremonial hose uncoupling. 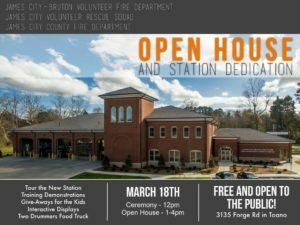 Following the ceremony, members of JCBVFD, JCCFD and JCVRS, will be hosting an open house for our community and our neighbors (from 1pm-4pm). During this time, there will be a lot of things for our citizens (especially kids) to see, touch and experience in regards to fire department life as well as fire safety. We are looking forward to this event and the opportunity to share this amazing facility with our community. We sincerely hope you will join us for this special day.